Modern materials mean new homes are not always made from wood. More expensive and fire-friendly than their brick or plaster rivals, wooden walls are a desirable, but not always economical, option. 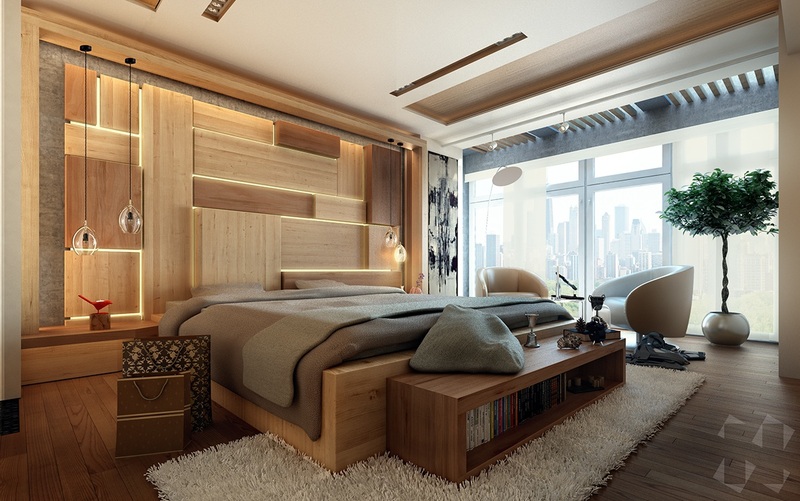 Keep the warmth and glow of wood inside your home, with these thirty wooden wall bedroom designs. 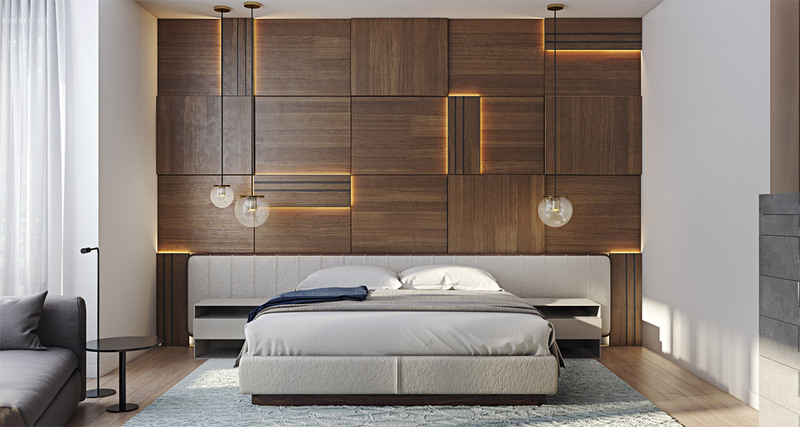 A full-scale alternative to wooden wall décorpieces, these LED, lamp or naturally-lit wooden walls add ambience to your sleeping space. Create curves and overlapping panels in light Scandinavian wood. Make a jungle scene with rough-shod or distressed wood alternatives. Take tips on how to do a wooden bedroom wall or partition right, with our thirty examples of rustic-look bedrooms. The earth was one Gondwanaland, before tectonic plates shifted its surface. This wooden-panelled design shows the earth before continents and countries, with LED-lit splits upon a warm wooden floor. 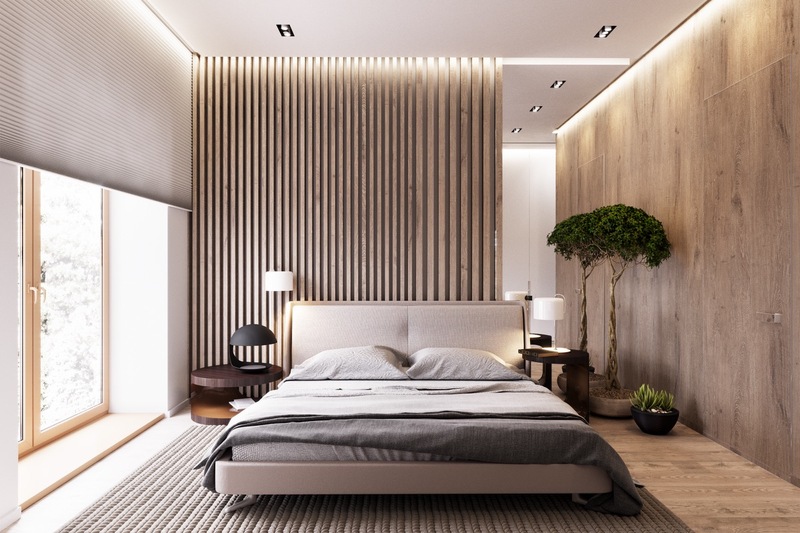 Light and bright is the theme of this wooden-panelled bedroom. Forming curved waves upon plywood, it creates an interesting interplay with a planet-like light. Wooden walls provide the perfect canvas for couples. Accompanied by grey, white and a large square window, panelled shafts add a contemporary feel to an otherwise basic bedroom. Wondering where the light is coming from? 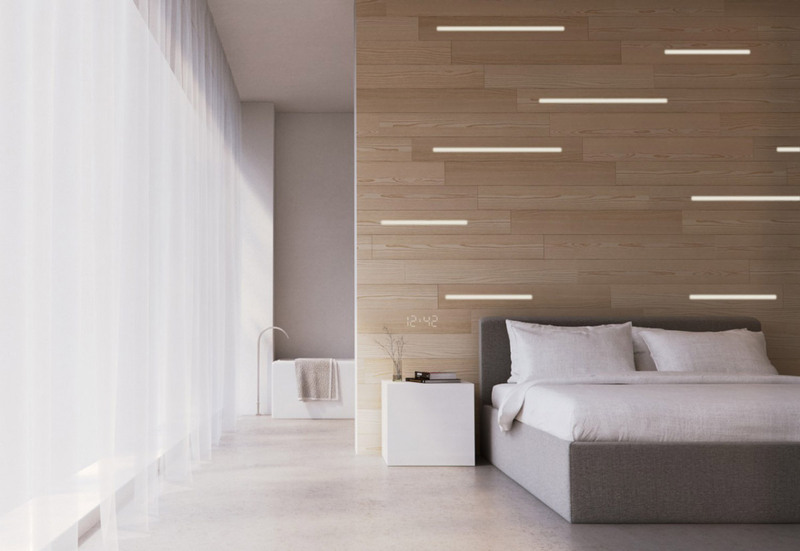 True to his trademark style, Kovr combines a wooden wall with smartphone-controlled LED lighting, making a striking design feature rise out of thin air. 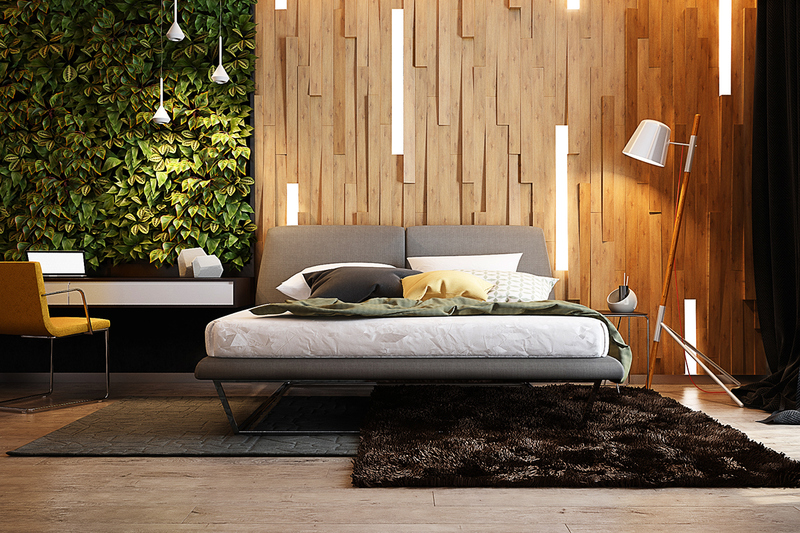 The urban loft would excel with this natural-looking wooden wall. Planted beside a living wall, its thin wooden panels match dangling oblong lights and fuschias. See more of this scintillating design here. Prefer your panelling in the other direction? 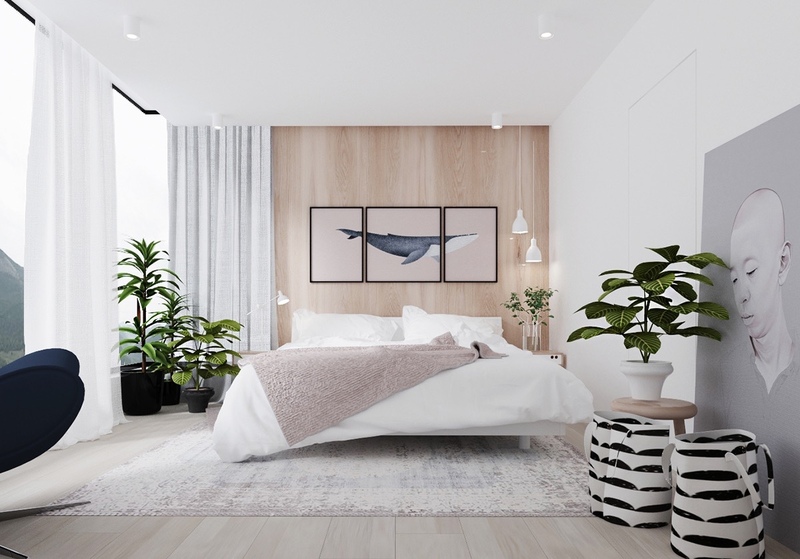 This horizontal wooden wall juxtaposes two fantail pendant lights and hanging plants, providing a rustic beauty with two bedroom ledges. Miss your childhood treehouse? 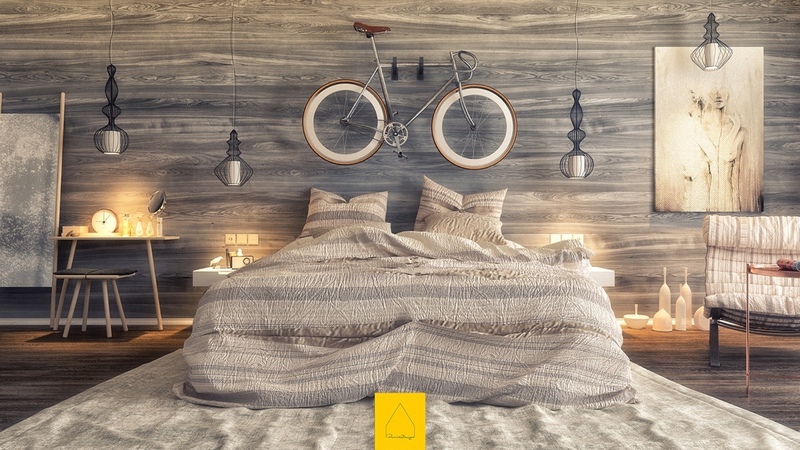 This wooden bedroom provides the next best thing, with a hanging hammock bed and spray-can artwork. Two tones of a wooden wall and ceiling provide simple and warm contrasts. Complement your wooden furniture with a feature wall of nooks and crannies. 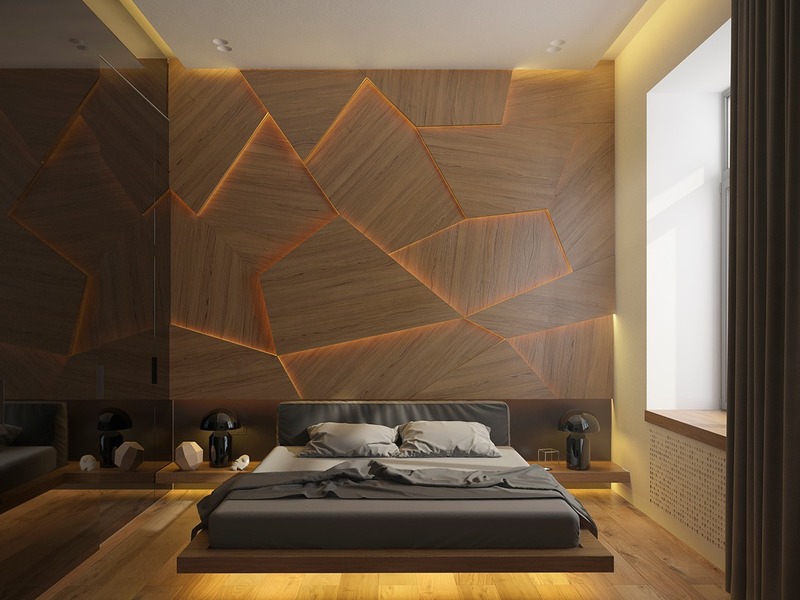 This LED-lit wall combines dark and light wood in one focal artpiece. A minimalist look works well with this chequered wall. Outlined and lit up by LEDs, its texture works with, not against, the room’s block elements. Stuck for a solution for low height bedrooms? 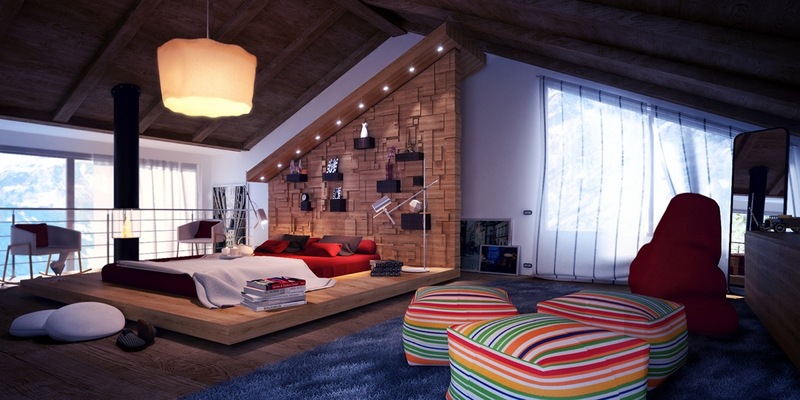 This attic-style abode makes the most of space, with a diagonal wooden wall and matching wooden platform. Hang your trinkets, pot plants and a few shelves below its circular lights for a bedroom feature. This bedroom is as rustic as a wood cabin and as light as a feather. 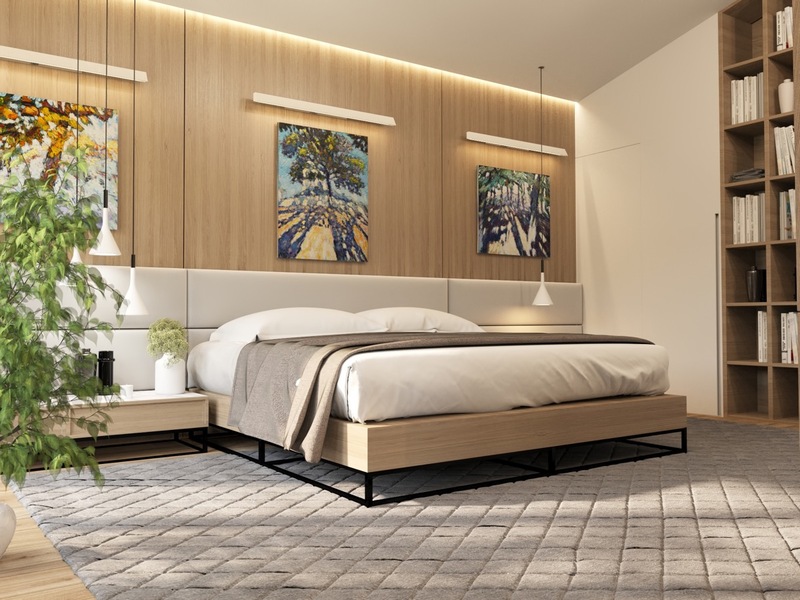 Pair rough-shod panelling in the shape of trees with contemporary elements, for a chic bedroom with a difference. Wooden slats are both functional and aesthetic. 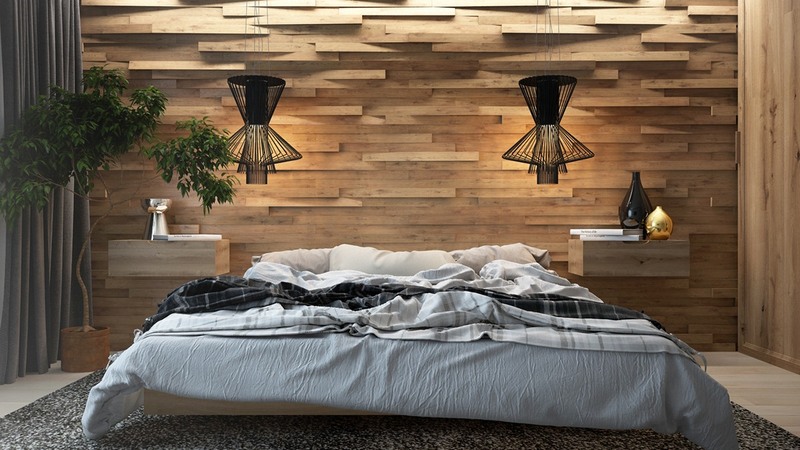 This find acts as both room partition and a light-infused example of wooden slats wall décor. There’s no need to keep your wood in one colour. 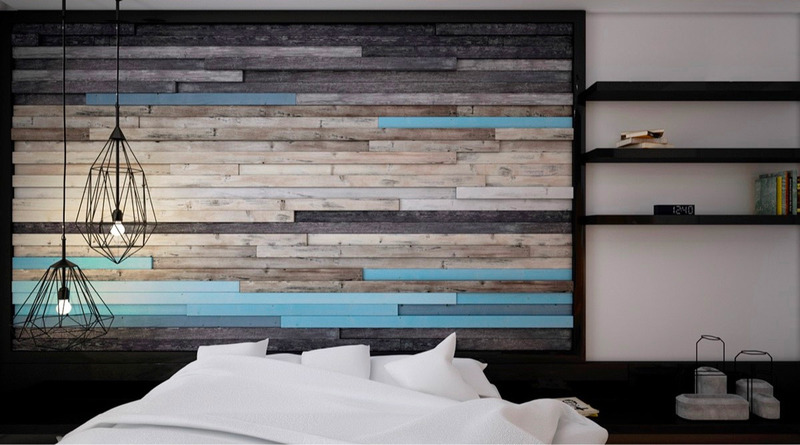 This alternating headboard turns wood dark and turquoise, as monochrome elements drop below and beside. Bring the outdoors indoor, with a block-panelled wall backgrounding a tree. 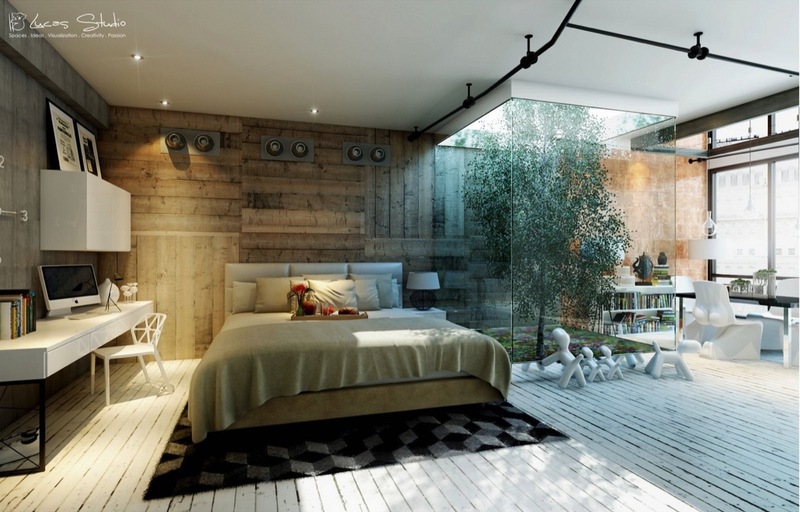 This bedroom, complete with an inside wooden deck, creates a wooden aura of mystery and light. Looking for something more conventional? 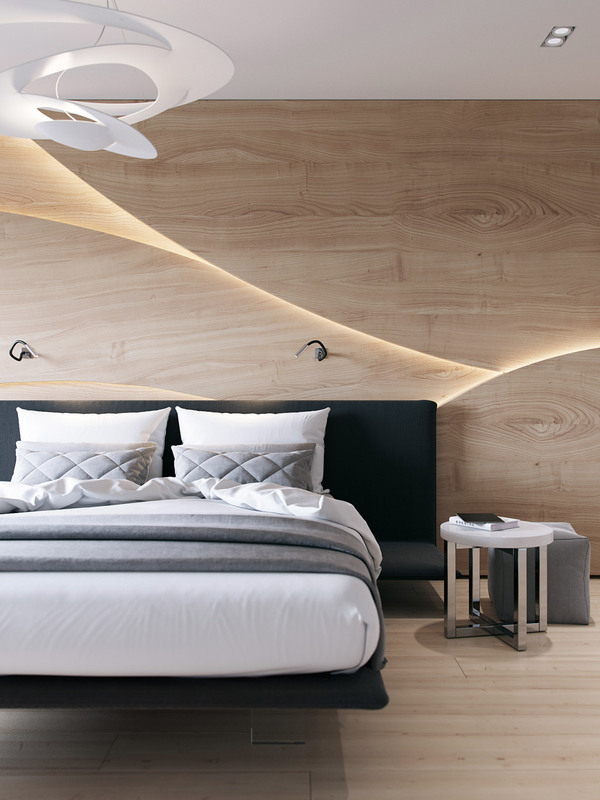 This low-lying bed blends perfectly with a smooth wooden wall surface. A wooden wall can be a great backing for art. These three forest scenes are offered warmth and simplicity by three-mid wooden panels. 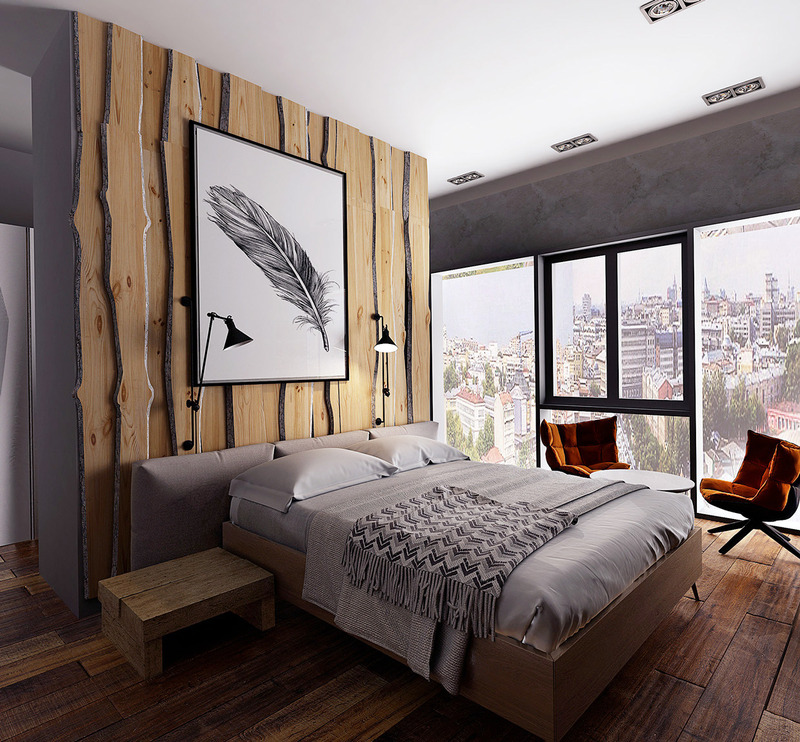 Find balance between the rough and the crafted, with a wooden wall with natural lines. Its warmer hues invite in light against a dull wooden floor. 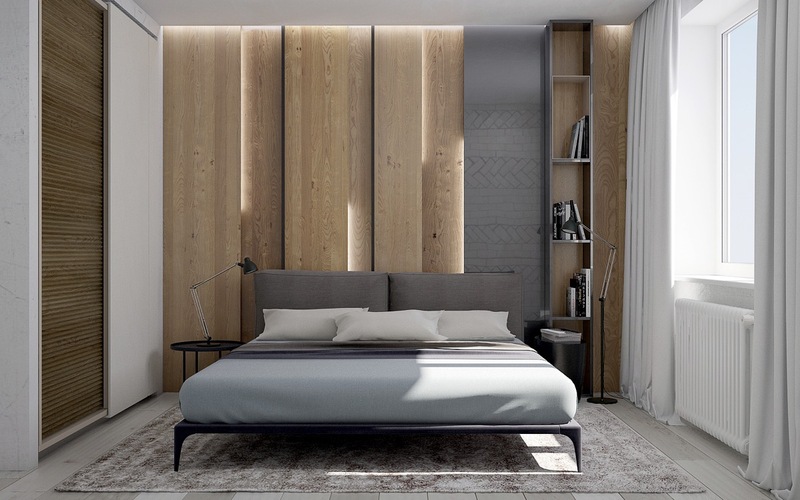 Go grey in a feature wall fit for a hipster’s bedroom. Holding a bicycle, canvas, drop lights and an easel, this colour is easy to adapt to many accessories. 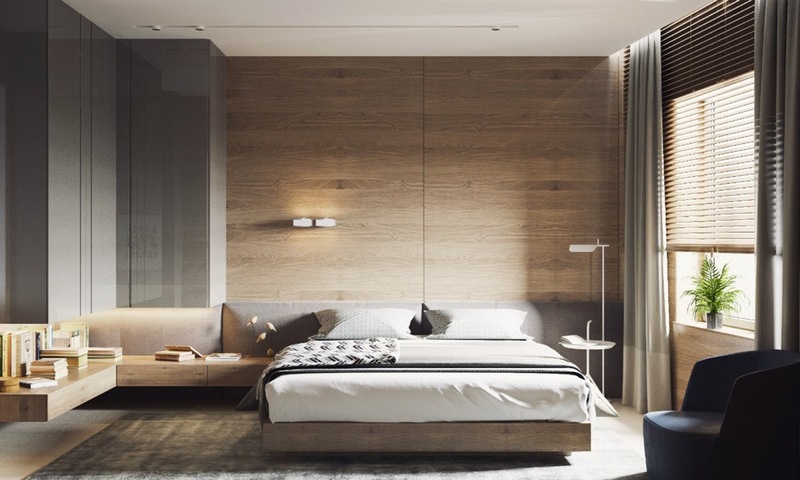 The lightest of minimalist bedrooms find a challenge in this wooden-walled find. Bathed in white with dashes of black and green, a whale triptych on wood draws in warmth-seeking guests.